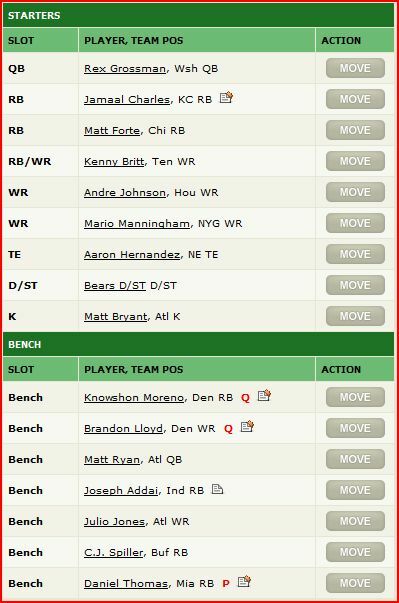 My team goes into it’s second game after suffering a loss in week one. This week, The Johnny Utahs present a whole new set of challenges. The Utahs, named after Keanu Reeves’s character in Point Break (the original), features Arian Foster, Phillip Rivers, and Dez Bryant. The team must be on it’s game all day to prevent another late collapse like last week. The addition of New England tight end Aaron Hernandez will give me an upgrade in the red zone over Lance Kendricks, the player he replaced. Hernandez exploded for 103 yards on seven receptions and a touchdown in week one. The second year player is often featured in two and three tight end sets in the Patriots offense. I also decided to drop Kyle Orton in favor of Redskins quarterback Rex Grossman. Grossman looked new and improved in his first game against the New York Giants, passing for 305 yards and two touchdowns. Matt Ryan will sit for the second week in a row. Ryan is playing against the Philadelphia Eagles. Expectations run high for Matt Forte, Andre Johnson, and Mario Manningham, who have favorable match-ups in their second game. Kenny Britt faces a tough test against the Baltimore Ravens, a defense that looked unstoppable against the Pittsburgh Steelers in week one. Britt was a favorite receiver for new quarterback Matt Hasselbeck, hauling in five of his ten targets. Bro, you would start Grossman over Ryan?